Our party tents & canopies will always make your event special & elegant. A beautifully customized tent can help set the perfect mood & ambiance for the party that later becomes the talk of the town, that cannot be matched in any other way. 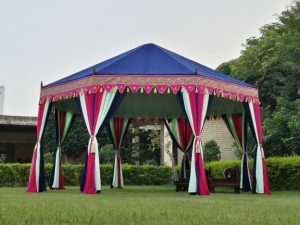 We make the Best Party Tents in India. 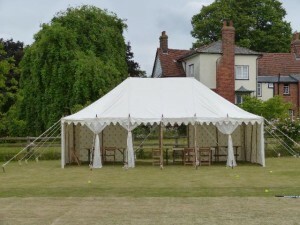 Small garden party tents and canvas canopy can add an extra charm to your party. Wedding vows and celebrations are best carried out in our smaller Garden Gazebos. The same tent on frame can be used for indoor party. We are sure you would love our range of Chaupal party tents for sale in India. This luxury tent is also known as the Maharaja Tent, a perfect ambiance for a wedding lunch under the sun, with a light breeze swaying the delicate voile drapes. 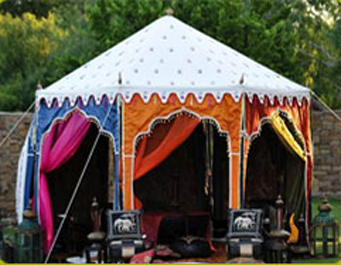 Beautifully decorated with cotton prints, the interior gives a very royal to this luxurious tent. Celebrate your next event with the best Hava Mahal tents offered in India. Weddings are made in Heaven and celebrated on Earth, under our beautiful marquees! Our marquees have splendid interiors, decorated with stars & mirrors or hand printed with beautiful Jaipuri patterns. 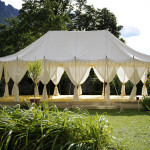 We suggest our traditional Indian marquees and white canvas tents for your perfect wedding. 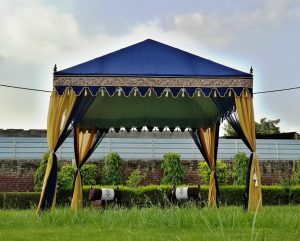 We offer Designer handmade Tents from India. Each event and its purpose deserve individual attention and detailing to tent interiors. 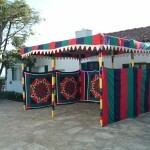 We design & develop all our Indian tents keeping in mind your theme colors & ethnic Indian prints. Based on your personal needs and preferences we customize Indian Tents for you, with beautiful hand block printed interiors. This frame tent is the cocktail & bar tent. It requires minimal seating, with a small food station and a bar. It is a frame tent and hence it has complete inner area for utilization. This space allowance is used accordingly in all our party tents for sale. 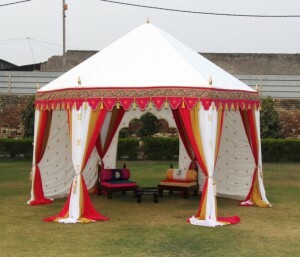 We offer some of the best Haveli tents in India with the best and exquisite designs. This is the beautiful and colorful sun shade from India. Used in traditional Indian weddings, this gives a very vibrant look to your party. You can buy this colorful party canopy from us. We are the Best Tents Manufacturers in India.